Eventually, we all deal with the fragmentation and mutability of memory. Certain events appear clearly in the mind’s eye; others might shift and realign with different narratives. 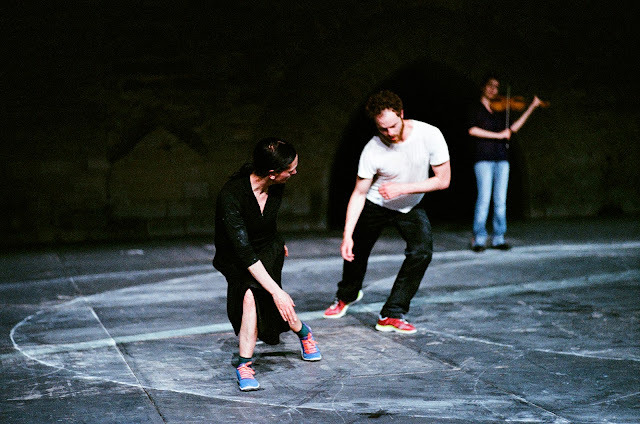 Anne Teresa De Keersmaeker and Boris Charmatz play with this idea in their engaging work in Lincoln Center's White Light Festival, Partita 2, at John Jay Theater, with Amandine Beyer on violin heroically playing Bach’s composition twice. The work's structure is simple and bold. In the pitch dark, Beyer first plays the five movements; De Keersmaeker and Charmatz then move to Bach’s absent rhythms; and finally the music and dance are performed together. Michel François designed the scenic scheme—a portal of light that moved left to right with the passing of time, and stage air lit by accompanying silvery, phasing moonlight. The music, by itself, offers a solid dose of sheer pleasure. Our hungry eyes are forced to rest, adjusting only enough to identify the shapes of surrounding viewers, but better off kept closed. And yet I was cognizant that I should be paying strict attention to the music’s rhythms and melodic lines to prepare for viewing the dancers, and noting whether—or how—their movements adhered or departed from Bach’s scoring. But that felt like trying to describe the molecular structure of ice cream while eating it. As well, watching the dance without music was certainly plenty of information by itself. 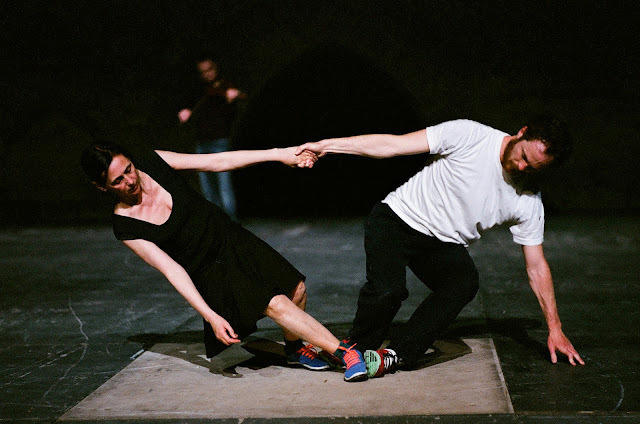 The duo offers its own tensions and felicities—De Keersmaeker, an icon in the dance world, is known for her disciplined choreography that mixes and enchains the seemingly pedestrian with great skill. Her delicacy and cat-lightness contrasted with Charmatz’s large frame and athlete’s bearing. Both sported sneakers; she in a black dress and top, he in a rugby-style shirt (they both shed a layer as the show progressed). In the second, unaccompanied part, their footfalls and shoe squeaks mixed with some verbal yips and chanting. I felt Bach’s beats, but without his crystalline melodies, it could’ve been any music. In the third, complete section, Beyer took a spot at center upstage, and De Keersmaeker advanced and retreated in a short line perpendicular to us, darting furtively around Beyer at the apex, touching her blouse hem, and then running downstage to peer at us. Charmatz chose a circular path around the stage, bolting a quarter arc and then coiling, bolting and coiling. These beginning movements did not seem familiar to me after seeing part 2, but soon memory and performance converged. Yes, I recalled when he picked her up and she walked on the wall, and later when he strode in a small circle and she, lying on the floor, placed her shoe soles against his in a funny cartoon mirror way. I still can’t say for sure whether the first couple of sections were the same movements. But the dance performances felt entirely different in silence versus with music. I appreciated the distinctive qualities of both, but mostly the rewards of the complete package, with its gorgeous dimensionality and spirit of collaboration.